The Pope could cancel his planned visit to Britain because of a “hugely offensive” Foreign Office memo mocking his stance on abortion and birth control, sources in the Vatican said. Senior Papal aides suggested the Foreign Office had not taken strong enough disciplinary action against those responsible for the document, which suggested the Pope should open an abortion clinic, bless a homosexual marriage and launch his own range of condoms while he is here. No-one has lost their job over the memo, which was sent to Downing Street and at least three Whitehall departments, and the civil servant who authorised it has simply been moved to other duties. One highly-placed source in the Vatican said: “This could have very severe repercussions and is embarrassing for the British government - one has to question whether the action taken is enough. “It is disgusting. Britain’s ambassador to the Holy See has been in to see the Secretary of State and explain what happened and this will all be relayed to the Pope. The memo, sent out in March following a “brainstorm” session by Foreign Office staff who are helping prepare for Pope Benedict XVI’s visit in September, warned recipients that the contents “should not be shared externally” because the offending document, titled “The Ideal Visit”, contained “even the most far-fetched of ideas”. 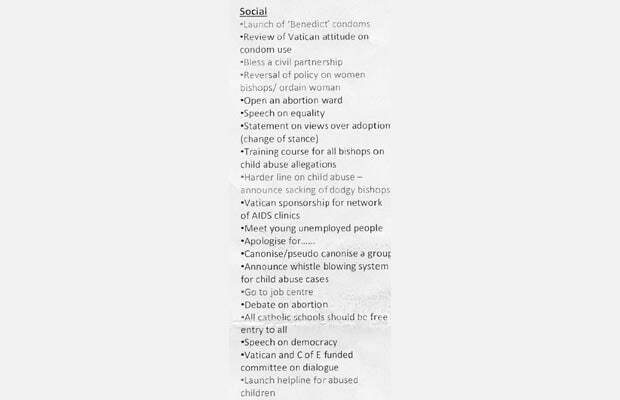 As well as suggesting the launch of “Benedict” condoms, the memo also proposed that the Pope should “announce sacking of dodgy bishops”, sponsor a network of AIDS clinics, conduct a training course for bishops on child abuse allegations and ordain a female priest. Embarrassingly for the Queen it also suggested getting the Pope and Her Majesty to sing a duet for charity and changing the national anthem from God Save The Queen to God Save the World. The Foreign Office responded by sending Francis Campbell, the British ambassador to the Vatican, to an urgent meeting with senior officials of the Holy See, and said the “foolish document” had not been cleared or shown to ministers or senior officials before it was circulated. A spokesman added that “many of the ideas in the document are clearly ill-judged, naïve and disrespectful” and the department was “deeply sorry for the offence which it has caused”. Father Federico Lombardi, the Pope’s spokesman, said: “I am aware that the Foreign Office has made a statement on this matter and I am aware of the contents of the memo. Sir Ivor, now president of Trinity College Oxford, added: “If it was a joke then it is in very poor taste. It’s very depressing and embarrassing to think diplomats would behave in such a way.